Murder By Decree. Highlight 1979. Our culture will probably never get tired of telling stories about Sherlock Holmes. I wasn’t sure if this was an adaptation or an original story until I remembered it was about the Jack the Ripper case, but I’m just looking forward to seeing Christopher Plummer try the role. He’s always interesting to watch, but I don’t think he’s the best at disappearing into a role. Particularly for a larger than life character like Holmes, I expect some scenery chewing. 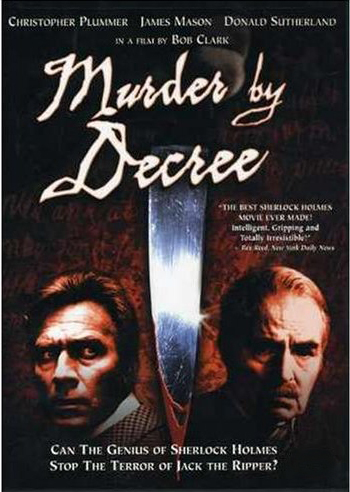 A string of murders of women eventually forces Scotland Yard to enlist the help of Sherlock Holmes. Police Commissioner Sir Charles Warren is very much against the idea, but is ultimately unable to get him off the case. A mysterious informant leads Holmes and Watson toward the discovery that all of the women had in common a friendship with Mary Kelley, who has gone into hiding. Holmes attempts to track her down for her own safety, and learns that the danger toward her is from a secret she guards against forces of great influence. I don’t think I’m a fan of “Sherlock Holmes + other pre-existing narrative” stories (see also Nicholas Meyer’s disappointing second sequel to The Seven Per Cent Solution, which sees Holmes solving the case of the Phantom of the Opera). I was expecting a fairly pure fabrication about Jack the Ripper creating a fun bit of adventure. Instead, I saw a dramatization of actual conspiracy theory and supposition that happened to star Sherlock Holmes, who was drowning in real history. Plummer’s Holmes was neither what I expect of a Holmes or of Plummer. He’s making a terrific effort to be Holmes, but he’s simply not the type, and ends up spending most of the movie just under-acting as a substitute for Holmes’s demeanor. I only found him in his element in the confrontation with the conspirators at the end of the movie. Meanwhile, I know James Mason is a big name, but I’m not sure I know his other work. He did better at being a Watson, but he was something of a Theme Park Version of the interpretation popularized by Nigel Bruce’s portrayal. The “pea scene” is funny, but it takes the idea of Watson as a simpleton to new lengths. There’s a touching moment where Holmes shows concern for Watson’s injury that echoes the scene in The Three Garridebs without reaching that depth. I find the “it was all a Freemason plot!” trope rather boring, but I can’t hold it against this movie. Freemasonry as a scapegoat seems to have been around in conspiracy theorism for decades, but it only entered popular culture through The Da Vinci Code and National Treasure, which are much later than this movie. Additionally, the Freemason angle wasn’t a choice made by the writers, but part of the existing story they set out to explore through Holmes. I’d probably object less if they’d used an original detective and the promotional material was clearer going in that this was based on real history and historical guesswork. As it is, it’s just lumping together other people’s ideas like fanfiction. If I knew that was what I was getting into, I’d have preferred to watch Time After Time (interestingly, also 1979). Watch this movie: to explore real fact and conjecture with your favorite detecting duo. Don’t watch this movie: to explore your favorite detecting duo while having fun with real fact and conjecture. Next Article Who’s Minding the Store?